View Our Other Listings. 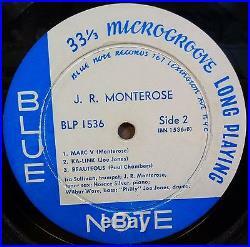 MONTEROSE / IRA SULLIVAN / HORACE SILVER / WILBUR WARE / JOE JONES. 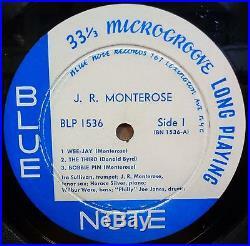 ORIGINAL DEEP GROOVE USA BLUE NOTE RECORDS LP. IN ORIGINAL REAR PASTED PICTURE SLEEVE. RVG BN-LP-1536-B (‘EAR’ SYMBOL). VERY GOOD++++ HAS QUITE A FEW LIGHT SURFACE MARKS. IS SPLIT ALL THE WAY ACROSS TO BOTTOM EDGE. HAS SOME WEAR TO CORNERS AND EDGES. HAS SOME LIGHT STAINING TO REAR. HAS SOME TAPE RESIDUE TO BOTTOM EDGE ON REAR. This help us ensure the item is received in the exact state and condition it left us in. Furthermore, if your expensive item is lost or damaged during transit we are both able to claim the compensation. This includes domestic and international packages. In this case; we have no problem in waiting for you and holding your items. We kindly ask that if you have any special requirements concerning the packaging of your record, that you let us know before paying; as extra charges may apply for extra packaging materials. We are commended for our packaging and only use top quality materials as supplied by COVERS 33. These are all the high-quality materials we use to package our items, depending on the price of the item we will either use cardboard mailers or multiple boxing materials. All of our materials are sturdy and we use a tried and tested method to follow when packaging our items. The above shows an example of a higher priced record placed inside a stiffened, high-quality box which is then placed inside a stronger, larger cardboard container to protect the corners of the record against falls or damage. If you wish for us to send your item inside a large cardboard box (shown in the above-right picture), PLEASE let us know before paying! We are Crazy Beat Records. We have in stock at any one time in excess of 100,000 items on vinyl & CD. We are highly respected (I hope) worldwide for our knowledge of our music and the quality service we try to provide. We have knowledgeable, friendly staff who are always on hand to help (and make tea & coffee)! Any questions you may have are completely welcomed and we strive to reply promptly and to be as helpful as possible. Crazy Beat Records 87 Corbets Tey Road, Upminster, Essex RM14 2AH Telephone. All of our items have been visually graded beneath a down-facing halogen lamp. We have found that this has proven extremely effective over the past 20 years. If there are any items that require further attention or for higher priced items, we would then give them a further audible play-grading. All of our items are professionally cleaned using a VPI Record Cleaner when necessary. All Photographs shown on our items are of the actual product, and are taken by our staff personally to provide an accurate visual display of the items. Our Auctions generally only last for a maximum of 10 days ONLY , ending at around 20.00 GMT on either a Sunday, Monday or Tuesday. Prices on ANY of our auctions. We strive to make sure our descriptions are always honest, accurate and to the highest professional standard we can achieve. The item “J. 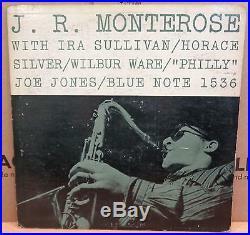 R. MONTEROSE IRA SULLIVAN HORACE SILVER WILBUR WARE JOE JONES BLUE NOTE LP 1536″ is in sale since Thursday, April 06, 2017. 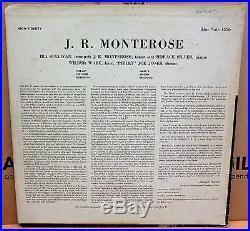 This item is in the category “Music\Records\Albums/ LPs\Jazz\Contemporary”. The seller is “crazybeat” and is located in Upminster. This item can be shipped to North, South, or Latin America, all countries in Europe, all countries in continental Asia, Australia.